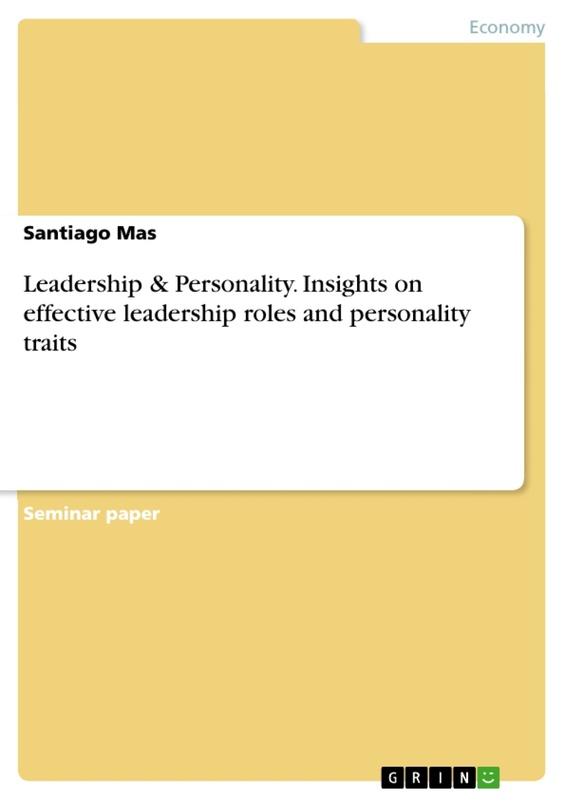 Leadership and personality have often been words cited together, as either the latter being a decisive aspect in the formation of the first or as a necessary factor to be able to effectively exercise leadership. The concept and qualities associated to leadership have evolved over the centuries from a more primitive and physically related term up to an intellectual notion nowadays. If in ancient times the leader was the figure of someone considered the strongest –behavior which can also be found today among animals- and the most powerful or ruthless in the battlefield, leadership is today associated with some unusual personality traits –with which some people are naturally born-, and extreme difficult to be found among the population, that continue to influence and impact others, not by using power or strength as in the past but by influencing thinking, opinion and behavior. Power, success, wealth and a charismatic personality are also some of the most commonly related features to such term. While this topic has been centered for some time now in the question around whether leadership skills can be learned or someone has to be born with them, it is important to think that any person has the potential to shape, improve or develop his/her personality in order to strengthen some of the qualities and values typically associated to leadership which will be reviewed in this assignment. Steve Jobs, Henry Ford, Gandhi, Nelson Mandela, Christopher Columbus, Isaac Newton, Albert Einstein and many others have led their companies, countries or in some cases mankind to overcome difficult situations, improve themselves and achieve goals which at first could seem unreachable. Either in business, in politics, religion, or science, they had the talent to stand out from the crowd and use their potential to inspire others and make them want to follow their examples. They did not use any power, title or money. They did not need it. They had something much more powerful. They managed to make other follow their vision. The main objective of this assignment will be to set the basis of what business leadership is today, and analyze its relationship with key personality traits that define it and are essential to business success. The topic will be approached by trying to answer the question, how these traits and features influence leadership? -and to what extent-, and finally discussing which is the impact of leadership in today’s business organizations. Leadership belongs to a much broader science studying the mechanisms, considered from a psychological point of view, involved in the process of guiding others. It is a wide concept not restricted to a specific field of knowledge, as leadership can be exercised in any sphere of life: politics, economics, sports, media, music, etc. It “is about articulating visions, embodying values, and creating the environment within which things can be accomplished “. Due to the nature of this paper for the HR module in the Master of Business Administration, the type of leadership discussed her will be business leadership as exercised today in organizations having a direct impact on their growth and value generation all over the world. There are as many definitions of leadership as people have tried to define the term and even today scientists cannot agree on a unified definition. That is why it has often been defined by explaining some of its most identifying personality traits, patterns, relationships and behaviors. However, although it has often been identified with business acumen and experience which could be counted in years or number of promotions, most authors have found some general consensus in the fact that leadership influences behavior and the will of others within a specific group to unite their efforts towards a common goal. And this does not necessarily require a title or a set number of years of experience. The first typical behavior in this section is called “consideration” as it involves showing concern at the personal level for subordinates; listening to them, defending them if necessary, or asking them for advice or suggestions. A second characteristic behavior in this category is called “initiating structure” as a way to show concern for assigning tasks to subordinates, following up their performance and their respect for procedural standards (rules, patterns, deadlines, etc.). This has gained importance over the last years, as employees do not just want to work having no voice in the decision making process, but want to actively be part of it. Empathy is a term often used which plays an important role at any organization. It is the ability of any person, especially in the case of business leaders, to put themselves in the shoes of other people, his/her employees, in order to identify their emotions and control them. Change is everywhere and recognizing the need for change and the adjustments required to successfully manage any transition is one of the main performance drivers of modern business organizations. Change-oriented behavior is a behavior in which the focus lies primarily in the planning and execution of adaptive strategies and approaches for any change-related factor or which might occur within an organization. This behavior can also be known as empowering or democratic leadership as it makes subordinates participants and to some extent also even decision makers through consultations or joint discussions. It does not mean that decisions are made by employees, but employees may express their opinion which will be finally also taken into account by the leader when necessary. This behavior is closely related to the task and relations behavior as business leaders need to develop in both cases a degree of empathy which allows them to see the person beyond hierarchical structures and understand that they need to be involved in any process to feel important and keep them motivated. Other names to refer to this behavior would be inspirational leadership as one of its main traits is to encourage innovation, critical thinking, improvement and a vision to positively stimulate subordinates. Employees need to be intellectually stimulated to develop their creativity. They want to see their contributions recognized and if necessary celebrated. Leaders must exercise an influence over his followers and offer them inspiration which helps keep their motivation levels. Leadership does not necessarily require a title to exercise its influence. Networking, monitoring and representing are external ways to indirectly exercise leadership. Networking has to do with growing, managing and developing a net of contacts among colleagues, superiors and people from other organizations in case they could provide any benefit or help in the future if required. Although it does not have such short-term impact, it is today of vital importance as creating and being able to keep an extensive net of contacts could be, if needed, of great help in a future professional career. Richards, D. & Engle, S. (1986), p. 206. Stogdill, R. M. (1974), p. 259. Coch, L., & French, J. R. P., Jr. (1948). Stogdill, R.M. et al. (1962).